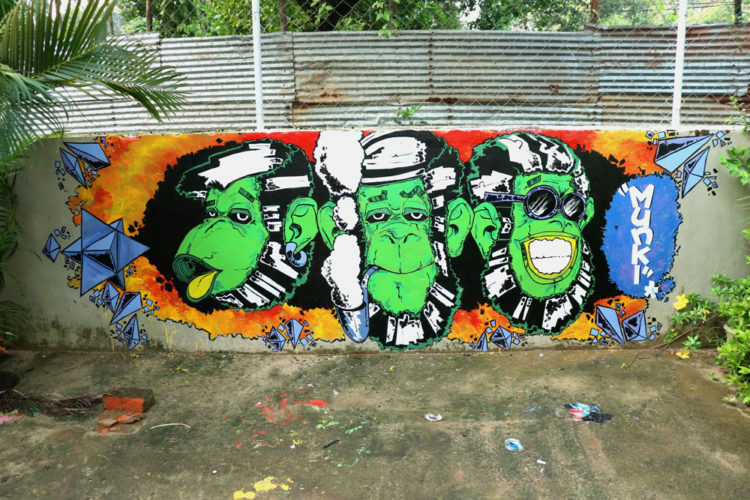 During a recent trip to India I stumbled across the work of Goan street artist, illustrator, and art director, Flyin Munki. 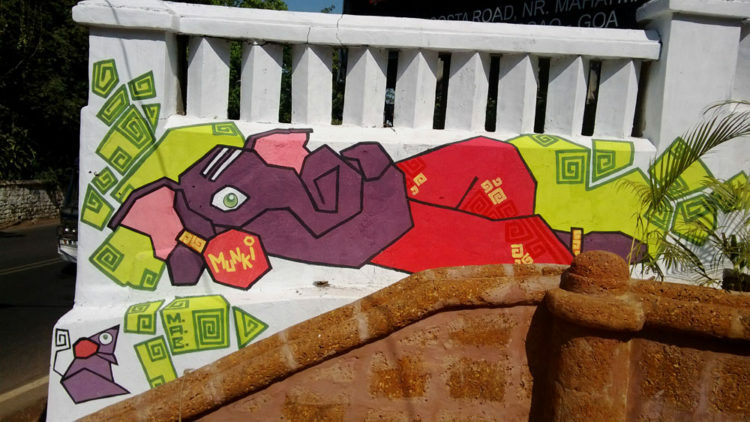 Impressed by his bold mural works I tracked him down to talk about life and art in Goa. Where does the name Flyin Munki come from? It’s the name my friends used to call me because of my sense of humor and the fact that I have to keep moving and can never really stay in one place. Also, I used to get high a lot. Does your work have any common themes or messages? I’m still experimenting because the mural scene in Goa is still very raw. Sometimes my work includes elements from current social or political happenings. What or who are your main influences? I’m an illustrator, mural artist, art director and a big fan of tattoo. So I draw my influences from all of those fields. I’m a fan of Banksy, Tristan Eaton and Shepard Fairey. I like the simplicity of Andre Saraiva, the work of illustrators like Matt Forsythe, Brett 2d Bean, Jake Parker, Filipo Cardu and Jon Sommariva, and tattoo artists like Dillon Forte, Marko Galdo, Corey Ferguson and Derek Noble. How has Goa and its culture influenced your style of art? I’m a proud Goan, mainly because of the states culture and heritage. Unlike the rest of India which was a British colony, Goa was colonized by the Portuguese and a lot of that history can be seen in the architecture, mainly the temples, churches, and the old heritage houses. The cuisine, the festivals, all of it has played a big role in my life as an artist and in developing my distinct style. 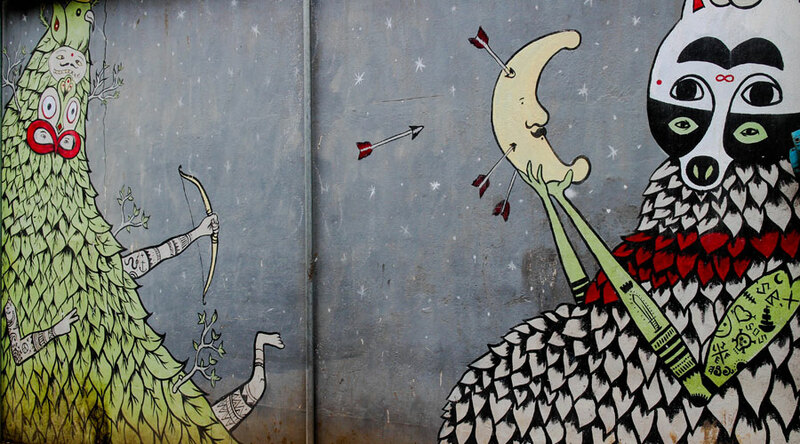 How do you view the Indian art scene compared to what you see happening internationally? The Indian art scene is picking up momentum, there are festivals like Kala Ghoda which welcome works by artists of all walks. Because we have a strong culture it takes time for the general masses to welcome new ideas. But, the country is seeing significant developments in design and painting, and there are more writers and mural artists now. In a backpacker hostel situated in Anjuna, North Goa called the prison hostel. 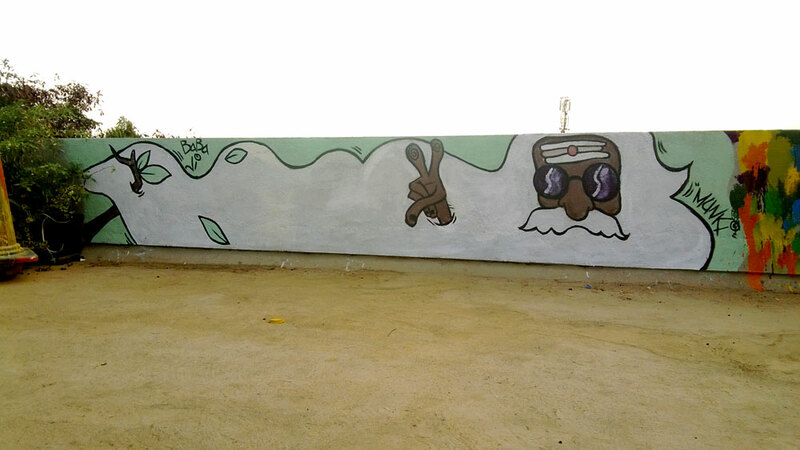 The place is covered by murals by local artists and I have painted two murals there. Also, the Hospicio staircase in the City of Margao, South Goa, where many artists came together to paint the entire staircase over a period of two days. What is the craziest thing that’s happened to you while painting in public? One time when I was preparing a wall to paint by applying plaster, a building contractor approached me saying he needed labor for painting. I was baffled and had to explain to him that I’m an artist, it took him a while to understand but I made my point. Can you recommend some good spots for other creatives visiting Goa? Do you have any new adventures, projects or creations coming up that you can tell us about? Yes, I have a lot of adventures lined up. Im looking forward to the Vans new wave music fest in association with MTV indies where I will be painting some murals. I also have a contract with a resort group and I am art directing an upcoming feature film.